CECILIA - Adoration. Vinyl LP. Bleep. Halcyon Veil (700 Bliss, House Of Kenzo) drops the debut LP from long-time friend of the label CECILIA (formerly known as Babi Audi). Adoration is a dense listen, full of strange sounds and shapes similar to the work of HV boss Rabit. 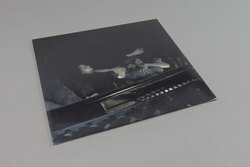 The soundscapes CECILIA creates here often go far beyond the deconstructed club fare of usual HV listens, with tracks like ‘Liber’ and ‘Recital (Where Your Money Ends)’ operating in a space of anti-ambience similar to artists like Inga Copeland and Yves Tumor. Elsewhere ‘House of Flesh’ and ‘Griselidis’ skirt the edge of the dancefloor while also maintaining an icy sense of detachment.